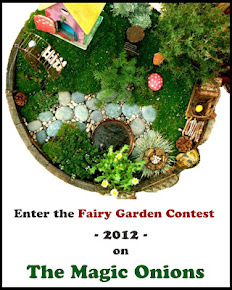 We make fairy gardens every year here at French Pemberley and have done so since 2011. Sometimes we use real flowers in them, and sometimes we use artificial. You can use either and create a stunning garden. Last year, the girls helped me pick out some beautiful spring flowers: marigolds, primrose, cyclamen, ranunculus, and some gorgeous Soprano Lilac Spoons. I loved how their petals looked like little spoons. Every year, it has become a spring tradition to replant new flowers for the faeries and spruce up their homes, which usually means throwing away dead flowers, adding new soil, and then assessing which accessories from the following year are ready to be retired due to sun or water damage and which ones can be reused. Since we live where winters are temperate, it is an activity we enjoy year round as the faeries add little jack-o-lanterns to their abodes during Fall; fairy sized Christmas trees appear come the holidays. Faeries love decorating. Last year, even with our warm summers, the flowers in the fairy garden flourished, but little hands doing their own flower watering made for a lot of messes to clean up and the wooden furniture only lasts a season when subjected to elements of water and sun, so this year we decided to use artificial flowers in the fairy gardens for the first time. I have been known to (now don’t you tell) get up early in the morning and sprinkle organic edible cake glitter dust on the flower petals. My girls get up, check their gardens and DELIGHT in the evidence that faeries have been there because there is “fairy dust” on the flower petals! Mr. Darcy always gets such a kick out of me hiding the “fairy dust” in my robe pocket, sneaking out, and giving the gardens a sprinkle without the kids seeing me. I get such joy out of their smiling faces as they marvel in the wonder and magic of visits from the faeries. Ah, thanks so much. They always seem to be a work in progress as we are always adding “this and that”! I will do an update post on them soon!